Home » Connectivity » Econet, Steward & the raid on The Source: Is this a violation of the Constitution? 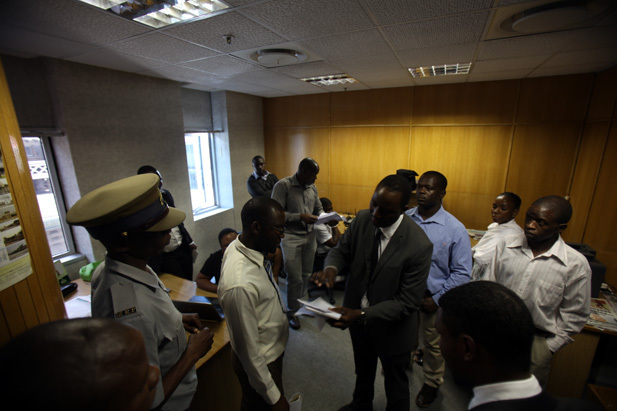 Econet, Steward & the raid on The Source: Is this a violation of the Constitution? Information we have so far suggests that the raid on a Zimbabwean based online publication, The Source, is about getting a journalists to reveal their sources. 2 February: The Source publishes an article titled “Debt-distressed Zimbabwe moves to reschedule domestic debt” in which it says the government has resorted to domestic borrowing and that Steward Bank, an Econet Wireless subsidiary holds US $30 million in government treasury bills, a deal brokered by Steward Bank former owner, Tawanda Nyambirai. Econet confirms to The Source that Steward Bank indeed holds government treasury bills and that Nyambirai was involved in structuring the deal. Today’s raid on The Source resulted in them complying to take down the article, but the internet doesn’t forget so you can find a cached version here. 16 March: Econet and Steward Bank obtain a High Court order to have the stories published by The Source withdrawn and conduct a search and seize operation at The Source. 20 March: The Source, challenges the High Court order granted to Econet Wireless and Steward Bank to have the online publication withdraw some of the stories it published on its site. It cites constitutional media freedoms violation. 26 March: Econet lawyers, Executives and IT people accompanied by The Sheriff and Police, raid The Source’s offices and succeed in having the stories taken down as well as going through the emails of the journalists. According to our sources, they copied emails and documents off these laptops. The case that resulted in the order to search and seize is apparently that The Source stole documents, but if this were the case of The Source stealing by means of accessing the premises of Econet or Steward Bank, then the case would be about theft and not about taking stories down. From what we observe from the facts in the media and industry, The Source simply had great sources who provided them information and that the constitution protects journalists from being forced to reveal all the information they have or to hand over their source. The raid is about trying to find out what the journalists know and where they got the information. Obviously, we’re not constitutional experts and we can only comment based on how we understand it. What is even more worrying is that by accessing the journalists’ laptops and copying documents, Econet and the police have accessed a lot of private information on many other stories and sources that do not concern them. It’s important to note that Econet is not disputing the accuracy of the articles. They even commented in one of them. They clearly just don’t want this information in the public and apparently are infuriated that a publication was able to access the information. We have reached out to both Econet Wireless and Steward Bank but we have not received any response yet. I wonder to what extent they are/will start leveraging access to peoples data through their networks to further their own ends. I never thought of them in that light before but its hard not to after this. I hate bullies. I really hate them!! And Econet is a bully. They spy on other companies, steal people’s ideas submitted to them through proposals and behave like a bull in China shop. Just one day, one day, they will get whats coming to them. Every dog has its day!!! If I was econet, and had so much power and grip on a country, I would do the same. I mean, why wouldnt I? I think hatred for Econet as blinkered some of us to the point of ignoring critical facts. 2. The concerned stories published “private and confidential information” to do with a bank and its clients; and transactions thereof. 3. The bank may be sued or lose clients because of the leakage of information. 4. The story quoted a letter from “Nyambirai to Econet Executives,” this is information placed in a safe or secured server. Having access to such raises great security concerns. We need to be objective on such cases. As corporates, Econet and Steward have full responsibility of their confidential information. Who leaked it? If information leaks into the hands of journalists, they will make news out of it. Thats News!!! Information whether leaked, gathered, seen, or whatever u wanna say, is a raw material for news production. If that ain’t news then what is news? If their server is not secure whose problem is that? Zvikaleaker tozviverenga ka. Yes, it was my oversight in leaving the gate unsecured and in employing a devious gardener. But I’d still sue you. You have your rights, and I’ll respect them as long as they are not trampling on mine. Imagine if data bearing your banking transaactions is leaked from Steward Bank (or any bank you use) and published in the media because it adds weight to the story? We wouldn’t stand it, but its “okay” if it happens to huge companies because hey, its fashionable to hate on the huge company, right? Now, lets wait for the courts to decide if the information The Source had in possession actually infringed on Econet’s privacy. If not, then yeah, we can yell ‘bully’ all we want. What is the purpose of power and influence if cannot use when someone steps on you. Bully or not, Econet are using their resources and kudos to them for doing it within the confines of the law. Chief, even Snowden, an employee of NSA leaked high stakes infor belonging to the US – the point is, these tactics by Econet infringe on freedom of expression. Imagine if you leaked the infor and they get your contact details?? Now imagine if YOUR contact details got leaked by someone at Econet to the media for some juicy story. Bet you wouldnt say they are just exercising their freedom of expression. Rather, you’d want that person’s head. Once someone appeals, you can wait for the result. You do not enforce prior judgement. An appeal is a cry to be heard but ZANUPF-Like Econet does not care about that. Not quite sure what the real issues are. From an investment perspective, Treasury Bills are borrowings by Govt, and this is public information. If a private company borrows on mortgage or borrows with security of fixed property, that information is no longer private but public by virtue of registration of such security at the deeds office, which is accessible by anyone wanting to. So the two issues disclosed in the underlining story are not cause for any court action by Econet. There could be something else, which unfortunately has not been made public yet. The relationship between Econet and Steward Bank is regrettable.The two are in two distinct industries that have different anthems. Regrettably, by virtue of common shareholding, the banking wing is likely to suffer from the cutting and pasting of telecoms decisions to the banking operations which does not work and will never work.Even the people cultures in the two industries are different. Departure of CEO could be explained by the same argument. The Source could be doing something right! Agreed. Riches and Christianity rarely mix well together. However, lets not pretend the police raiding offices is a new thing just because Econet bought government treasury bills. They are used to it, and have acted on much…much less. Econet only seems to have taken advantage of an already existing structure which, like it or not, so far seems to be within the confines of the country’s laws.